Windows. That’s one of International Institute Director Anna Crosslin’s favorite parts of the International Institute of St. Louis’ new location. Its previous office building only had skylights on the second floor. The old sign is still up at what is now the International Institute. 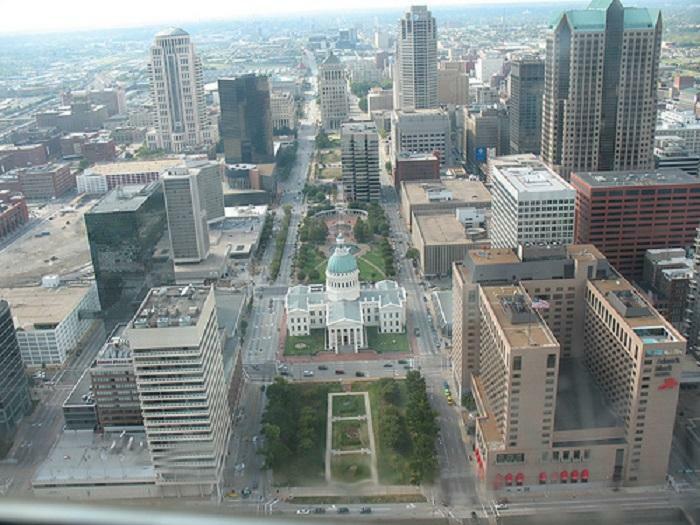 After 16 years at its South Grand location, the International Institute of St. Louis is moving to 3401 Arsenal Street. Today marks the first day of operations in the new building, which once housed St. Elizabeth Academy. Crosslin says one of the reasons they decided to move was because of space, which they have plenty of at the Arsenal location. The building has four times the square footage of the previous location. The institute currently serves around 7,500 immigrants and refugees, providing English and citizenship classes. Crosslin estimates the number of individuals they assist will nearly double within the next 10 years, if the Mosaic Project meets its goals. “If we wanted to continue to serve the foreign-born population, we couldn't stay where we were,” she said. The increase in square footage will not only provide more space for clients, but also enable the institute to expanded programs and host more community events Crosslin says. The institute will begin new programs right away. Career Advancement For Immigrant Professionals will start on Feb. 10. The program focuses on soft skills training for foreign born individuals who have degrees. Soft skills are those that will help them build networking skills, learn how to interview for positions and prepare resumes. The large gathering spaces will such as the gym, cafeteria and former church will host a wide variety of events. The gym is still filled with boxes from moving. It will soon serve as a community center. What once functioned as a sanctuary now houses the institute's “hall of nations.” In September, a citizenship ceremony will be held there. The gym is now a community center. 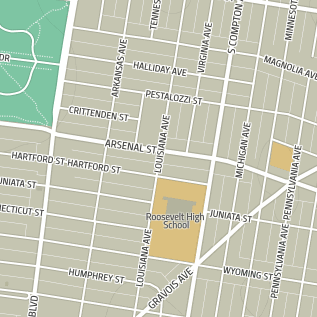 The new location for the International Institute is at Arsenal and Louisiana. Crosslin says there are also several potential uses for the school’s cafeteria and industrial kitchen. They may host ethnic community lunches as part of a food service learning opportunity. The kitchen could also be rented to caterers who don't have a space of their own. “So there are a lot of different ways here in which we will be able to meet the mission of the institute and engage with the wider community,” Crosslin says. The new building also comes with a radio station. The 100-watt station will be used as a teaching tool, possibly offering language training or citizenship classes over the airwaves. 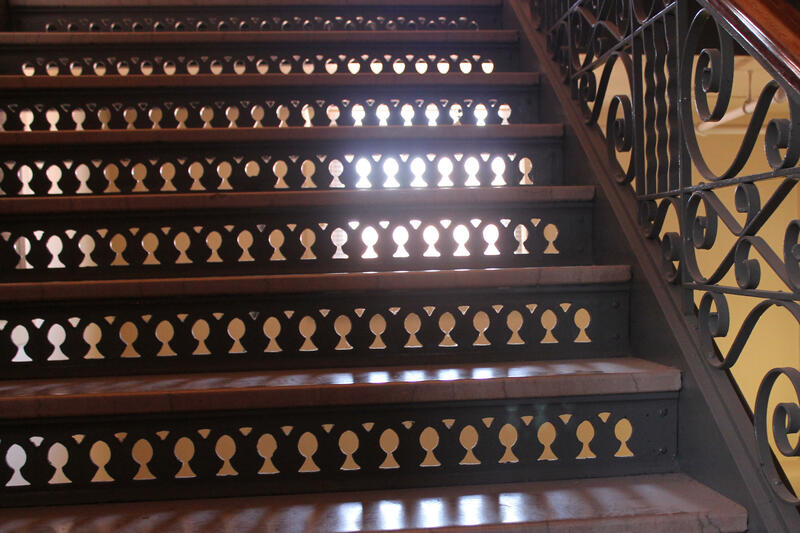 A staircase in the original part of the building, which was established in 1882. Crosslin says it’s important that the new space not only act as a place to gather and learn, but also a space of acceptance for refugees and immigrants. The acquisition price of the Arsenal building was $1.6 million. Crosslin says so far renovations have cost a little over $2 million. Operation costs for the new building are $125,000 more than they were at the previous location. Crosslin says they hope to cover the difference through rental fees for multipurpose spaces in their new building. An earlier version of this story incorrectly listed the acquisition price. The correct price is now listed. Tigrinya, Nepali, Somali, Arabic, Vietnamese: These are just some of the languages that clashed as translators relayed information about becoming a U.S. citizens to more than 100 lawful permanent residents. Many of those in attendance at the St. Louis International Institute event were refugees. 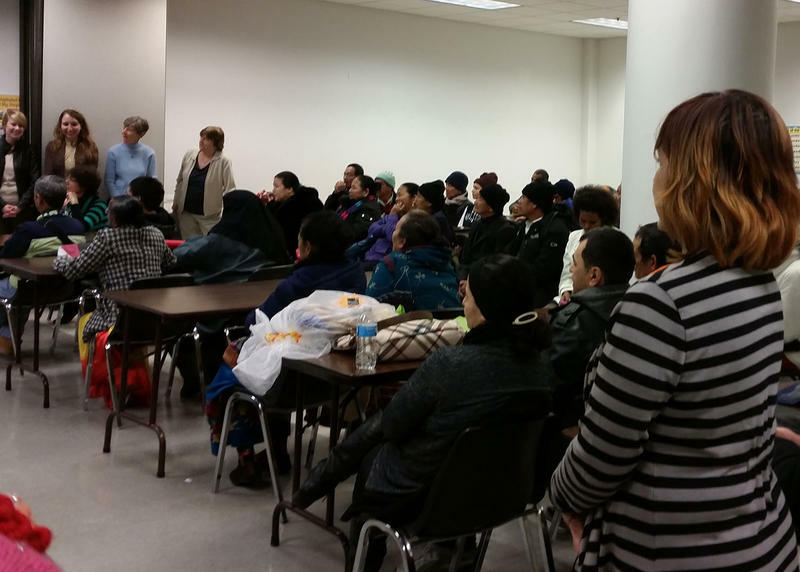 The information session covered requirements for becoming a citizen, the application process, classes available at the International Institute to help prepare for the citizenship interview, medical waiver information and success stories.